Take a good look at these pictures and you should easily see that this is no cheap linen walking suit but a high quality walking suit made of real Irish Linen. This Irish linen walking suit is made by the leader of premium walking suits, Royal Prestige. Featuring rich Irish linen that you'll swear is made of cotton, this fabric will let you know right away that it's just better. Featuring a baggy fitting double chest pocket shirt with diamond stitch detailing on the shoulder placket and down the front, This linen walking suit has some serious style going on. The pants are baggy and double pleated as well. 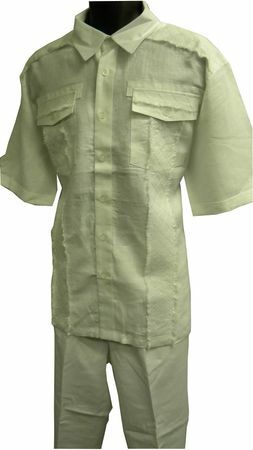 Shop for many more styles of Mens Linen Walking Suits Here.